I Skate, Therefore I Am: Is ESPN killing Women vert skateboarding? ESPN just scratched women's vert skateboarding from the July 28 X Games in Los Angeles. This is what ESPN posted on their website: "We look for sports that have a solid year-round infrastructure, a growing participant base, an established annual competition schedule, rising youth talent pools, ample access to courses, low barriers of entry into the sport and myriad other factors," a statement from ESPN X Games read. "After thoughtful discussions and evaluation of many of those factors, we have decided to discontinue the women's skateboard vert competition from X Games 17." 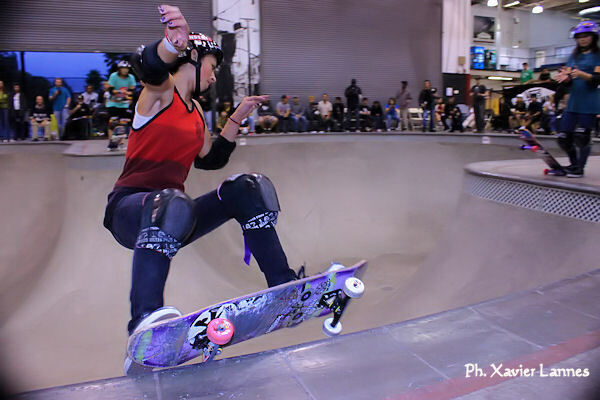 Women's skateboarding debuted as an official X Games sport in 2003. Lyn-Z Adams Hawkins competed every year, except for 2006 when she was injured. "As an eight-time X Games medalist, I want to thank ESPN and the X Games for the eight years of opportunity they gave our sport to grow," said Adams Hawkins, a three-time gold medalist in the event. Yet after an initial surge in popularity, the women's vert discipline struggled to sustain a viable competitive tour. Finally, the X Games was the only remaining major competition. "Being in the X Games is the motivation behind most women vert skaters; it's what we dream of and strive for," said Adams Hawkins, 21, of Cardiff-by-the-Sea, Calif. "So what the heck are we supposed to dream of now? As it stands today, we have no vert contests to look forward to. This, unfortunately, is going to end the growth for women's vert skating as we know it." In 2006 women's skateboarders were the lone female athletes competing at the summer X Games. Still, they led negotiations with ESPN executives to secure higher prize purses for women athletes across all sports at both the Winter and summer Games. Women and men now receive equal prize money at X events. The movement for equality was led by the Action Sports Alliance, a non-profit organization founded in 2005 to create equal opportunities for women's skaters. The Alliance was co-founded by Cara-Beth Burnside, the matriarch of women's skateboarding who went on to win three X Games gold medals in vert. ﻿ But as Burnside grew older, few female skaters emerged to fill the vert ranks. Now 42, Burnside lost her major sponsor, Vans Shoes, earlier this year in another sign of the discipline's decline. Meanwhile, women's street skating, which remains part of the X Games program, has surged with up-and-coming talent. "I think it's a shame, especially with the amount of interest in women's skating and new talent lately," vert skateboarding icon Tony Hawk texted about the decision to drop women's vert skating. In addition to women's Skateboard Street, the X Games features women's Moto X, a SuperCross racing discipline. And this year, women's Moto X Enduro, a kind of off-road steeplechase motorcycle race, will be added. "The X Games is very proud of its leadership position in showcasing and helping grow women's action sports," the statement from ESPN read. "As with the men's sports and disciplines, we evaluate each competition every year." Of course not everybody think like ESPN, especially Amelia Brodka (she ranked 10th at WCS last year) who published a strong response to the initial ESPN decision. On her blog, Amelia is analyzing point by point all of ESPN’s arguments. The rebuttal clearly argument that several claims from ESPN are unfounded. There is clearly a solid and growing youth talent pools (well –pool is the word) with Lizzie Armanto, Alysha Bergado, Alana Smith and plethora of other amazing young vert riders. There has been a definite rise in the amount of girls who skate. And I’m not only talking about street, but also vert, park, bowl and any transition. Those who had the chance to go to Vans Pro-Tec pool party last week, remember Lizzie Armanto in the pool in-between sesh… There were about 40 women competing in the Girls Combi Classic last November- which is more than double that of the preceding year’s Protec Pool Party. And the level was excellent. If you think women should participate at the X-Games, go sign the petition at Stop Excluding Women From The X-Games. For more arguments regarding why women have a place in today’s vert skateboarding, go read Amelia Brodka’s blog.